This is a question we get a lot. The answer? Everyone wants a good deal, right? Who doesn’t like a sale or a good bargain? If I could get a Hummer or Jaguar for, let’s say, the price of a Dodge or Nissan—it would be GREAT! No offense, but there is a price difference in these car makes for a reason: there is a quality difference. There are attractive upgrades that make your life more enjoyable. Let me take a moment and explain a little—The German Shepherd originated from Germany but American breeders strayed far away from the true German standard that has been known and loved for years!! There are issues with the American-bred Shepherd because the registry does not enforce any breeding standards. Yup, I can breed 2 floppy-eared brother and sister AKC Shepherds and sell them. Yes! And people will buy them because they are cheap!! Now they “might” even look beautiful to you, but are maybe lacking in bone structure, in temperament, and usually have drastic health issues. With all these un-knowledged breeders out there, offering puppies for less than a quality breeder can, we have an epidemic of faulty dogs with all kinds of problems. With many sellers, it’s all about the money. 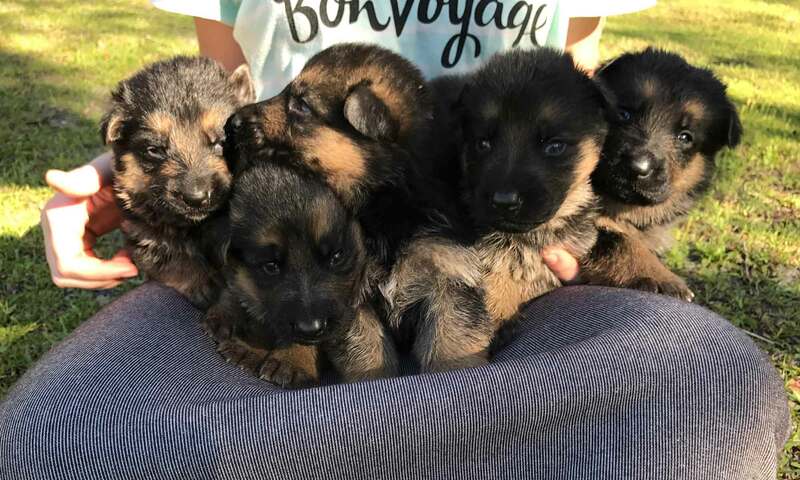 They are NOT knowledgeable with the standards nor the health issues in the American Line German Shepherd which are mostly absent from the German dog, because in Germany there are STRICT regulations to keep the breed near perfect in all aspects. My dogs are the Beautiful Show that can work and make a wonderful addition to any family. I breed to keep with the standard and to improve the breed’s temperament and health. A German Shepherd dog is an all-around dog. A family, farm, and work dog. They can do it all. This is no longer found in the American dog. Know the breed standard: their faults and health problems before you buy. It takes $ to buy a Quality German Shepherd and $$$ to import (1,500 Euros just to ship). It takes money for hip/elbow and testing. We use high quality food and our dogs live indoors! There is a lot of time and money that goes into a quality German Shepherd puppy that you can be proud to own. I pride myself in breeding healthy, big-boned, confident dogs. Guaranteed! Even with all this, my price is still lower than most importers and breeders of Quality German Shepherd dogs. I raise my puppies so that they will fit in any situation whether it be with elderly, with children, as a working dog, farm dog or police. My Dams are imports and come bred from Europe (Sire stays in Europe). Some have show or working titles—and most have their hips X-rayed and are clear of any hip issues. This is what will make the price a little different. Also if the puppy/dog will be used for breeding to make money, then the price on this pup will be higher for the breeding rights. Now that you’re more informed… be sure to check out my available litters.